3. Dealing with a slaughter age broiler is …very distressing – a large chicken with the psychological maturity and needs of a small chick, and a peep to go with it. this is Muk Muk 5 week old broiler and love of my life. Muk Muk was ready at this age for slaughter. 4. Anytime I choose to eat chicken from a supermarket, fast food chain, restauramt, I am eating baby chicken. 6. When I eat a broiler I am eating more fat than protein – I have raised them, loved them, cuddled them – they are designed to be fat and they are. 7. 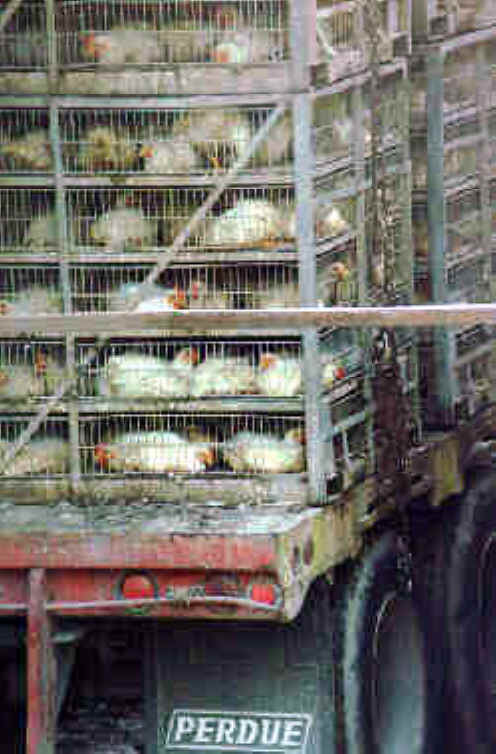 The transport and handling of chickens on a daily basis and on transport to abbatoir is rough and production like in its execution – the majority of broilers go to slaughter with the pain of broken legs, wings and massive briusing. 8. Broilers are shackled – hung upside down by their legs for slaughter and passed over a rotating blade which may or may not slit their throats effectively. 9. They are left to bleed out – the loss of conciousness is after the loss of function – this is not considered humane. One wants a loss of funtion and conciousness simultaneously. 10. Free range chicken meat is a myth. All broilers are barn raised, some companies have a small outside area for them, but who cares when your body is aching, you yearn for a mother you dont have and her protection. I have watched my baby broilers look for a mother figure the momemt they come to us, and imprint on human or chicken mother. As all baby chicks do. The desire is that strong. 11. The concept of free range as a myth for justifying meat eating as articulated by Professor Melanie Joy – would you feel any better eating a free range loved golden retriever because you knew it had had a good life up until its slaughter? 13. To kill a person., a chicken , another animal is an act of violence – I dont want to be a part of that. 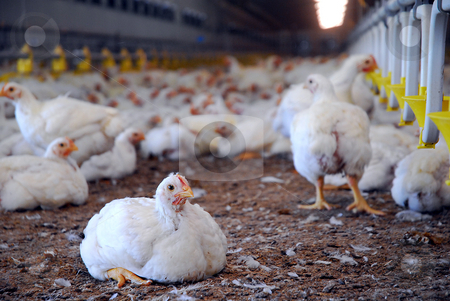 These are some of the facts of the chicken meat industry. I have not sensationalised or embellished them. 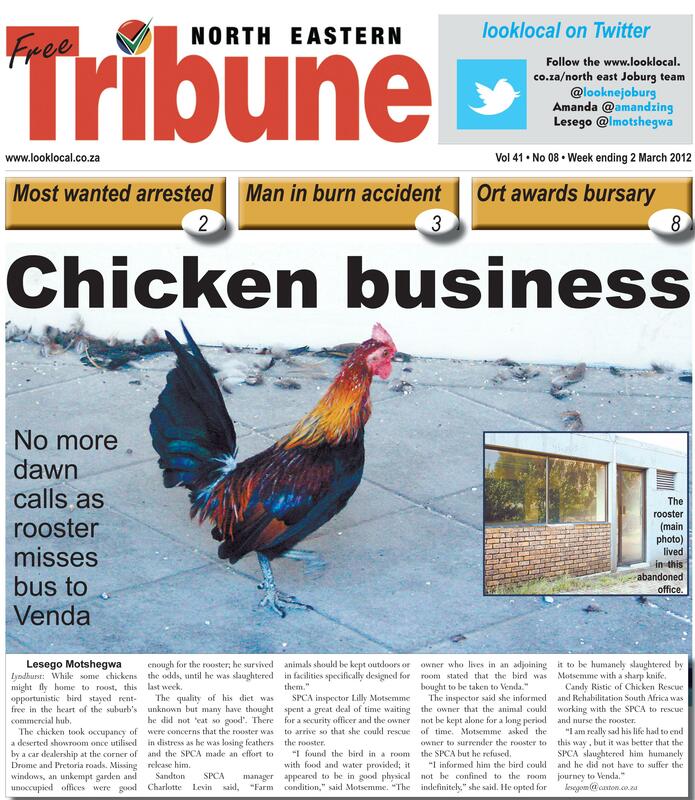 This is the reality for many thousands of chickens in SA and around the world daily. I starting a section called medical on this blog – as I am so often asked medical and euthanasia questions. 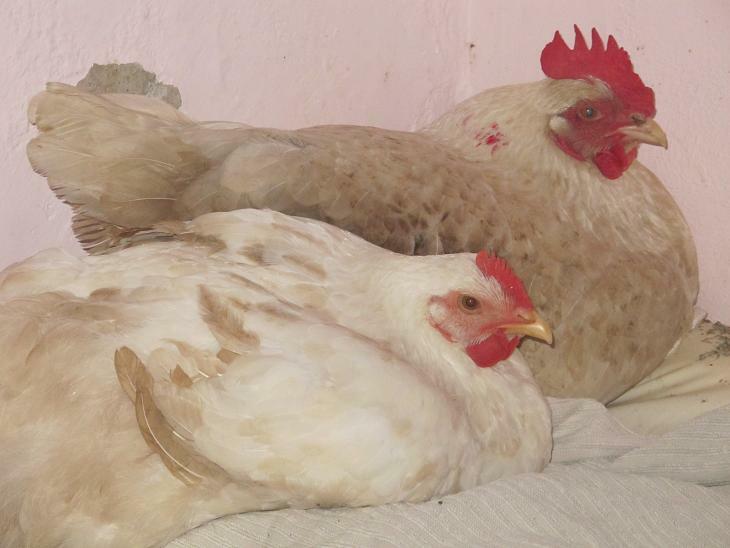 The opionions expressed in this medical section are my own opinions, and only based on my experience in rehabbing sick chickens and animals – what we have tried and been succesful with, or unsuccessful. I am NOT a vet, and if you have access to a vet, that is the route you should go for responsible animal care. Our blog could assist you in making decisions, or in supportive care, but we are not a substitute for good veterinary care or advice. Euthanasia is an ethical and personal decision in itself, never mind the ethics then around how to euthanase. I am pro euthanasia if the animal is suffering more than what I would persoanlly want to go through (by the way – the option of euthanasia is what I would want for myself, which is the only reason I can enetertain this as a possibility). If there is no quality of life, and no near future hope of a decent quality of life. the health or well-being of the animal is grounds for concern. I am not in favour of euthanasing healthy animals, but understand the welfare issues surrounding this. Compassionate euthanasia involves the loss of consciousness and function simultaneously. Any drug that paralyses muscle use, but conciousness remains while suffocation occurs, for me, is not humane. For example with drowning, function is lost before consciousness – this is not humane. Front slitting of throat – so common in abbatoirs – the animal loses function, but not consciousness. Yuck! The drug ‘euthanase’ , for example, assists the loss of both conciousness and function simultaneously. There are other methods that achieve the same result. 1. I never euthanase without a proper 2nd opinion (preferably veterinary – and a veterinarian I have a relationship with and trust). I cannot reverse my decision, therefore it needs to be a well considered decision. 3. In the abscence of birds or animals being able to tell us what’s wrong, we must assume that what would be painful for us would be painful for them. 4. I try what I can to prolong life in a humane way before making that decision, unless keeping them going for even a day more would just be torture. 5. I spend time watching a healthy hen (animal) for 1 minute and record everything she does in that one minute (head turns, pecks floor, runs three steps etc) – now spend 1 minute on your unhealthy hen (animal), and see if vast difference in behaviour). How big is that gap? 6. 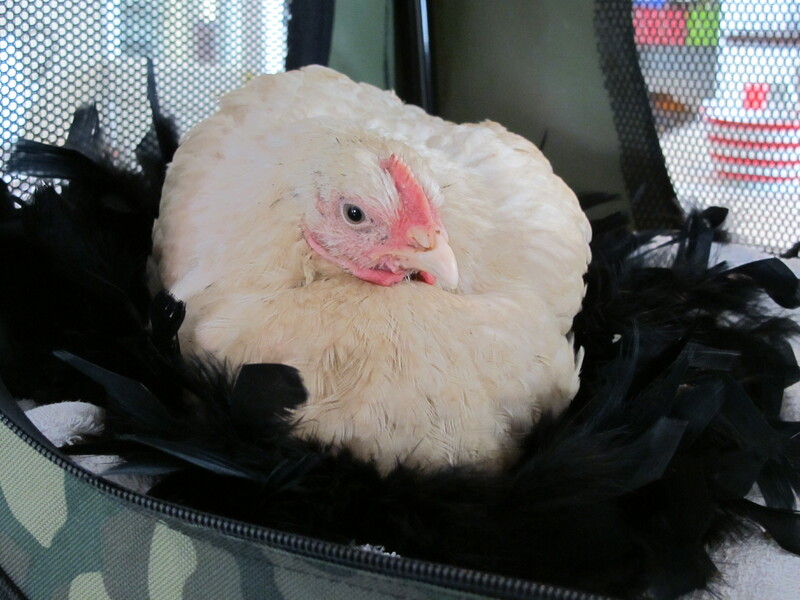 Is your hen eating, drinking, foraging, preening? If they are too ill to eat or drink, then I assist. If this goes on for too long, I re assess. Starving or de hydrating is a terrible way to die. 7. I spend a lot of time before making a decision to euthanase, sitting quietly with my animals. This allows me to be present to their pain and discomfort, and to make a better decision. 8. I will always try and euthanse at the place where the animal lives, if this is possible. It reduces stress. 9. If possible I will always try and medicate my animals pre euthanasia to limit anxiety.